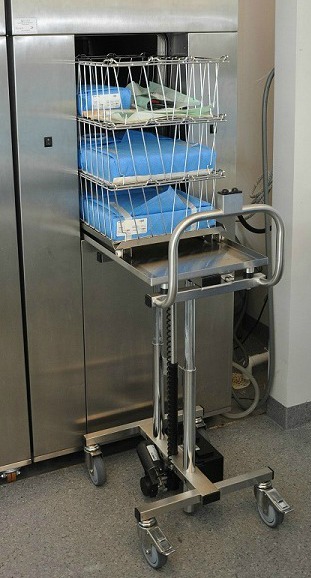 The Remeda loading trolley is designed to load and unload sterilizers in the sterilization and operating departments. The trolley is used together with a transfer platform that is rolled into the chamber. The platform rest on the chamber floor. The height of the trolley can be adjusted so that loading/ unloading can be carried out at suitable working height. Thanks to the unique lifting system, the trolley is exceptionally easy to clean. The height adjustment is electric and controlled by an easy operated control placed on the handle. The trolley is delivered with a charger cable for the battery. The handle is mounted on the top part of the trolley. 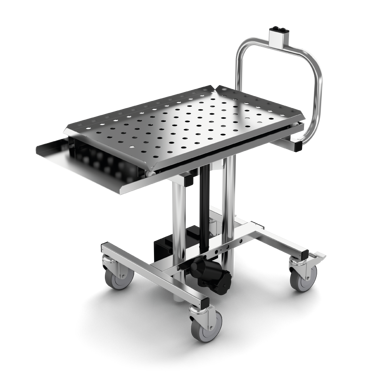 The trolley is manufactured in stainless steel with a frame in stainless steel profile piping. Equipped with four castors with diameter 100mm, of which 2 with brakes and 2 with direction locking. The trolley is designed for autoclaves with square chamber opening width of 460mm. The loading height to be specified on order.